Harnesses & SafetyThere are 9 products. Tailored harness pads for additional comfort when using race harnesses. For use with all 2 inch shoulder straps. Tailored harness pads for additional comfort when using race harnesses. For use with 3 inch shoulder straps. 4-Point harness with 3 inch shoulder and 2 inch lap straps. HANS compatible and FIA approved. 4-Point bolt-in safety harness with 2 inch straps. Fitment: For cars with harness bar fitted. Designed to accept bolts or eye-bolts for use with bolt-in or clip-in harnesses. 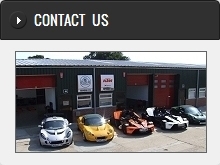 Fitment: Elise and Exige S2 Onwards (including Elise S3 models and Exige V6). Harness bar for wrap-around harnesses. Fitment: Elise and Exige S2 Onwards (including Elise S3 models and Exige V6). Luke 4-Point harness with 3 inch shoulder and 2 inch lap straps with spreader. For wrap-around or bolt-in type harness bars. All colours in stock Pair of harness pads with velcro closure for use with 3 inch shoulder straps. Fitment: For use with 3 inch shoulder straps.